Your certificated Fit-ex operator will visit you at home at a time to suit you to prepare a free, no obligation quote. This service is free and will allow you to select from actual samples of our top quality range of curtain poles, curtain tracks, blinds, awnings, conservatory roof blinds and wooden (Plantation) shutters. To make your decision making easy Fit-ex offer a measuring service to home owners, interior designers and curtain makers. There may be a charge for this service which is refundable when you place your order. (Subject to order value). 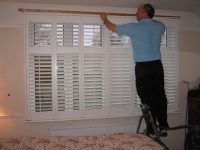 Fit-ex can measurer for any type of treatment: curtains, blinds, hardware for bay windows, conservatory roof blinds, wooden shutters – whatever you need we can measure and confirm the size or quantity of material you will need to make your soft furnishings fit perfectly.